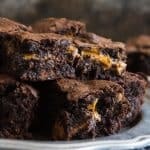 These Butterfinger Brownies are rich and fudgy, with the signature crispety, crunchety, peanut buttery-ness of Butterfingers! Don't wait until you have leftover Halloween candy to make these! Make sure you grab an extra bag of Butterfingers Peanut Butter Cups to have on hand just for baking these frightfully delicious Halloween brownies! Sift together the flour, cocoa powder, and salt in a bowl. Combine the butter and chopped unsweetened chocolate in a large microwave-safe bowl. Microwave on high in 30 second bursts, stirring well with a spoon or spatula between bursts, until completely melted and smooth. Allow to cool for a few minutes. Add the slightly cooled melted chocolate and butter to the eggs, sugar and vanilla and stir to combine using a wooden spoon or spatula. Sprinkle the sifted flour, cocoa powder and salt over the batter and gently stir it in, just until no streaks of flour remain. Stir in the chopped Butterfingers and Butterfinger Peanut Butter Skull Cups. Pour the brownie batter into the prepared baking dish and bake for 35 to 40 minutes, until a toothpick or skewer inserted into the center of the brownies comes out mostly clean with only a few crumbs attached. Be sure not to overbake.